Eczema (also known as atopic dermatitis) is most common in infants where it occurs in around 1 in 5 children under 2 years of age. It can also occur in older children and adults but usually improves with age. Although eczema can be effectively treated and managed, no cures are currently available. Eczema is a condition where patches of skin become inflamed, itchy, red, cracked, and rough. Blisters can also occur. It affects a large section of the American population to a lesser or greater degree. The term eczema is used in two different ways. It can be used widely to describe any rash-like skin conditions. Or it can be used to describe atopic dermatitis, a chronic skin condition that commonly starts during infancy and continues through into childhood. Some people outgrow the condition while some people will continue to have it into adulthood. The word “atopic” refers to a collection of diseases involving the immune system, including atopic dermatitis, asthma and hay fever. “dermatitis” means inflammation of the skin. Why some people develop have eczema is not well understood. It is common for people with eczema to have or develop other allergies, suggesting that inherited (genetic) factors increase the tendency to develop eczema. That does not mean that allergy to any particular substance causes an individual to get eczema. The skin in people who suffer from eczema is different from those people who do not have eczema. In people with eczema the skin barrier does not work as well. The skin has less water retaining properties, and moisture is easily lost from the skin causing it to dry out easily. This does not mean that people with eczema can improve their skin by drinking more water, or that the skin cannot provide adequate protection from the environment. Eczema commonly manifests itself in infants with dry and scaly patches appearing on the skin. These patches are often intensely itchy. The symptoms of eczema can vary, depending on the age of the person with the condition. Rashes commonly appear in creases of elbows or knees or nape of neck. Rashes can be especially prominent on neck, face, and around the eyes. Rashes can cause scaly skin (more scaly than in children). Adults who developed atopic dermatitis as a child but no longer experience the condition may still have dry or easily irritated skin, hand eczema, and eye problems. Allergic contact eczema (dermatitis) – a skin reaction following contact with a substance that the immune system recognizes as foreign. 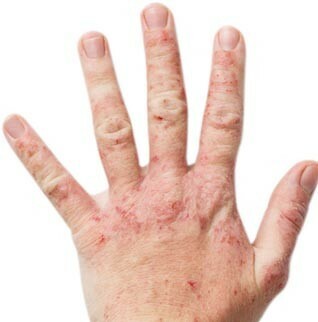 Dyshidrotic eczema – irritation of skin on palms of hands and soles of feet characterized by blisters. Neurodermatitis – scaly patches of skin on head, forearms, wrists, and lower legs caused by a localized itch such as an insect bite. Nummular eczema – circular patches of irritated skin that can be crusted, scaling, and itchy. There is no single test that is used to diagnose eczema. The doctor may need to see a patient multiple times to make an accurate diagnosis. This is because people with eczema experience individual combinations of symptoms, which tend to fluctuate in severity over time. Diagnosis is based primarily on the patient’s symptoms, but medical history is also important. A doctor will often ask about a patient’s family history, other atopic diseases such as asthma and hay fever, possible exposure to irritants, whether any foods are related to flare-ups, sleep disturbances, past treatment for skin symptoms, and the use of steroids or other medications. Patch testing – substances are placed onto the surface of the skin to test for skin allergies. Skin prick testing – a needle containing a small amount of a suspected allergen pricks the skin to test for allergies that do not necessarily occur on the skin, such as pollen or food. Supervised food challenges – foods are eliminated and then introduced into the diet to determine whether a food allergy is present. There is no cure for eczema. Treatment for the condition aims to heal the affected skin and prevent flaring of the symptoms. Doctors will suggest a plan of treatment based around a patient’s age, symptoms, and current state of health. Applying moisturizer (selenium, zinc and vitamin E) within 3 minutes of bathing to “lock in” moisture. Moisturizing every day, use aloe vera and or lavender. Wearing cotton and soft fabrics, avoiding rough, scratchy fibers, and tight-fitting clothing. Using mild natural soap or a non-soap cleanser when washing. Air drying or gently patting skin dry with a towel, rather than rubbing skin dry after bathing. Avoiding rapid changes of temperature and activities that make you sweat (where possible). Learning individual eczema triggers and avoiding them. Using a humidifier in dry or cold weather. Topical corticosteroid creams and ointments – these are a type of anti-inflammatory medication and should relieve the main symptoms of eczema, such as skin inflammation and itchiness. If ineffective, systemic corticosteroids can be prescribed. These are either injected or taken by mouth; they are only used for short periods of time. Antibiotics if there is an overlying bacterial skin infection. Medications to treat fungal and viral infections. Antihistamines that cause drowsiness are often recommended as these can help to reduce the risk of night-time scratching. Topical calcineurin inhibitors – a type of drug that suppresses the activities of the immune system; it decreases inflammation and helps prevent flare-ups. Barrier repair moisturizers – these reduce water loss and work to repair the skin. Phototherapy can be prescribed to treat mild to moderate dermatitis. It involves exposure to ultraviolet A or B waves, alone or combined. The skin will be monitored carefully. Even though the condition itself is not presently curable, there should be a particular treatment plan to suit each case. Even after an area of skin has healed, it is important to keep looking after it, as it may easily become irritated again. It may be worth breast-feeding a newborn baby for three months or more if several members of the family suffer from allergies such as eczema, hay fever or asthma. There is, however, no evidence to suggest that the mother should avoid any particular foods during pregnancy or breast-feeding. Eczema is a skin condition that many people of all ages suffer from. It cause severe mental and physical discomfort and can be very difficult do endure. Eczema outbreaks usually cause a lot of skin irritation and itchiness that agitate the sufferer. As the condition usually appears in large batches and is often clearly visible, sufferers also experience a lot of emotional difficulties. Many report feelings of insecurity – they feel unattractive and ashamed of their condition. Eczema is a chronic disease, which means that it can rarely be fully cured, but there are effective treatment methods that can ease the symptoms, limit outbreaks and help you achieve an overall better quality of life. Fight the outbreaks with food Many health conditions, both skin-related or not, can be helped by following the correct dietary regiment and Eczema makes no exception. The best way to go, is eat as much raw and organic food as possible. This type of meal is natural to the human body and nourishes it best. On the other hand, there are also foods that can irritate the skin and worsen the problem. Avoid processed foods, as they are full of chemicals, artificial sweeteners and saturated fats. Also, try staying away from alcohol, caffeine, meat, gluten and dairy. The magic powers of coconut oil Cold-pressed, organic coconut oil has become a sensation and rightfully so. Even large and well-respected fashion magazines are now advertising the natural healing powers of coconut oil. It is great for the skin and just perfect for treating Eczema. Coconut oil contains a very rare substance called lauric acid, it helps fight bacteria and microorganisms that can cause skin conditions such as eczema. What you can do is substitute all the oils you use in the kitchen with coconut oil and also use it as a moisturizer. It soothes the skin and penetrates deeply to protect it from unwanted environmental and chemical damage. C for Care Vitamin C is a great way to protect and nourish your skin and can help fight eczema outbreaks. The wonderful substance contains essential nutrients that strengthen the immune system and help it fight infection. That is why vitamin C is also very effective in treating the common cold. It also has antiinflammatory effects and protects the cells from stress. You can either purchase vitamin C supplements, or you can try eating more fresh fruits and vegetables, especially orange and yellow ones. Say no to stress Often the reason for skin conditions stems from increased stress levels. Stress is functional, it makes you strive to achieve certain goals, it keeps you alert and is a natural bodily mechanism, so long as it is not excessive. Too much stress is damaging for all organs, not to mention the severe psychological damages it can cause. Sometimes a disease, such as eczema, can be psychosomatic, meaning that there are no physiological factors that explain its onset and development. Rather, it has stemmed from psychological issues that have manifested as physical symptoms. eczema may be your body’s way of telling you that you are enduring too much stress and pressure. Salt baths for clear skin Bath salts come in many varieties and scents and as long as they do not have any chemical additives, they are a wonderful way to keep eczema away. Dermatological studies have shown that bath salts smooth out the skin, reduce redness and inflammation and relieve itchiness. All you have to do is dilute a few tablespoons in your bathtub and take a relaxing soak. Moisturize with aloe vera and Vitamin e aloe vera is one of the miracle workers of nature. It is no wonder that so many cosmetics companies use it in their products – it is one of the most potent moisturizers and skin-soothers. Vitamin E, on the other hand, is used in many beautifying recipes due to its anti-inflammatory properties. You can combine equal parts of the two and pad the skin gently with a cotton ball. Soak in oatmeal Taking an oatmeal bath is one of the most popular eczema treatments. Blend about a cup of oatmeal into very fine powder, place it in your bathtub and pour hot water on top. Then take a 15-minute soak. Oatmeal is so popular, because it soothes itchy and irritated skin, it also helps with redness. Essential oil remedy essential oils are always a great way to improve your skin condition. They rejuvenate and moisturize the cells, along with helping them fight infection and skin roughness. For best result, mix just a drop of chamomile or yarrow in jojoba or almond oil, then rub all over the skin. But I was not having this disease from birth and none of my family members have ever had this disease. I never knew that there were natural remedies too, I use a lotion like product Foderma which also claims to be natural and I am very satisfied with it too. 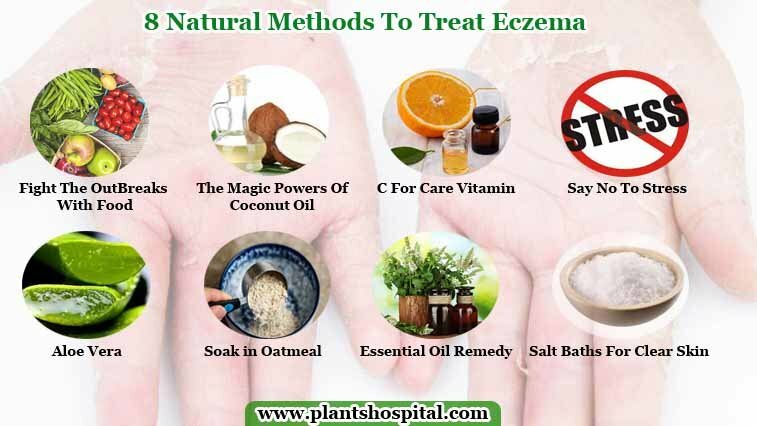 But will now try out these natural remedies too if eczema appears again. Hello everyone. I’ve been having eczema for two years now and for me, it has been really difficult to control it. thanks for the help! for everyone else, the treatment that has helped me a lot is foderma.